This club has been meeting on Monday evenings in Exeter since July, 2003, but it changed its location in mid-July, 2005. The current location is at the Riverwoods at Exeter, 7 RiverWoods Drive, Exeter NH 03833. At this location, the stated club hours are from 6:00 p.m. to 10:30 p.m. Often, club attendees arrange to start earlier, such as at 5:30 p.m. Playing time may also extend past 10:30 p.m. when players want to play later. Each session consists of 4-7 games starting roughly on the hour. Players are welcome to attend for any part of a session. There is currently no fee to attend this club. The club provides score sheets for those who need them. As of early September, 2007, this club is using a new system to issue weekly reports. 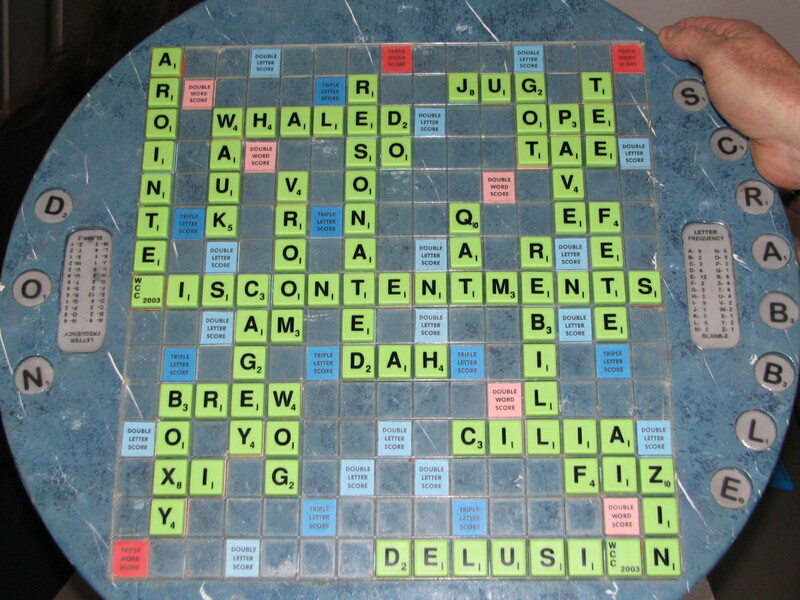 This is the same system which has been used for many years in the Lexington SCRABBLE® Club. You can read about the details of this system here. This club had been directed by NASPA-certified director Kath Mullholand, but since she has relocated her home, she no longer attends on a regular basis. Currently, there is no particular director in charge of this club. For more info, contact player Mike Wolfberg, preferably by email, or at 978-496-1397 (H). Attendance at this club has been spotty and there have been many evenings when there are too few players. Therefore, Mike has been polling players each week to find out who will attend. If you would like to play at this club, please email Mike to indicate this and to check if there will indeed be a club session. Get onto NH Route 101. From I-95 North, pay a 50 cent toll, and exit at Exit 2 in NH, then head West on Route 101 for 1.5 miles to the first exit, Exit 12, which is "Route 111, Exeter/North Hampton". At the foot of the ramp, turn left onto Route 111 West and note your mileage. Follow Route 111 for 2.8 miles to a signal at the intersection of High St. (which you are on) and Portsmouth Ave. (on your right). Go straight through this intersection and over a short bridge, and proceed to the Bandstand in the center of Exeter. At the Bandstand, note your mileage and make a sharp left, staying on Route 111. Continue 0.5 miles to the Exeter Inn, which is a red brick building on the left. At this point, keep right at the "Y" intersection, and continue on Route 111 for 1.8 miles further (thus 2.3 miles from the bandstand) to a blinking yellow signal. Turn left onto RiverWoods Drive. Pass two houses on the right, and turn right at the RiverWoods sign. Visitor parking is on the left, just before the STOP sign. Note: There is a sign with arrows to various points in RiverWoods, right after the visitor parking. Go straight, to "Information", and you can drop off anyone who doesn't want to walk the 150 or so yards from the visitor spaces. The club meets in the Arts and Crafts Room, which is air conditioned when appropriate. You can ask the receptionist for guidance to the room. You can view a map showing where the club meets. At the Exeter, NH Club tourney on 20-Mar-05, a 15-letter word ended up on the board in the H row. It began with CONTENT by Ed Liebfried. It was extended by Keith Hagel to CONTENTMENTS, and then Ed made the final dISCONTENTMENTS. You can see a picture of the final position of this game here. This club is included on this web site since it is relatively close to the Boston, MA metropolitan area. This is one of the only three active clubs of which I am aware in the state of New Hampshire. The others are the Peterborough Club #808 and the Manchester Club #510.